I have been MIA for quite some time now. There are several reasons for that. In December, my husband and I filed for divorce. Due to that decision, I put enlisting in the Army on hold. Since then, I’ve moved to Arizona. 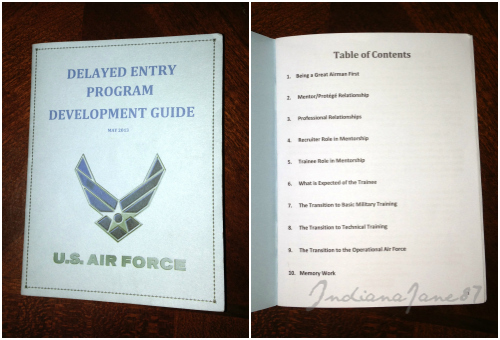 On February 12th, I met with an Air Force recruiter. She gave me a packet to fill out and I returned it on the 25th. Today I scheduled my MEPS visit for a week from tomorrow. Due to tracking all my medical documentation down for the Army last year, I had everything I needed to enlist into the Air Force and this process has been quite quick and seamless. Since I last posted, I’ve lost weight (I’m now down to 135 lbs) and have maintained a consistent running schedule. Today I ran my fastest 2 mile run in forever (17:53) but still need to increase my pace. I think I will add in a day of interval running and see how I progress with that. I’m racing the clock to ship to basic before my 28th birthday. I turn 27 in July so I do have time but depending on the AFSC that I get/ship date/and how long I’m in DEP, I could be cutting it close. But I’m glad how quickly things have progressed so far. The Army recruiter that I had in CA did not seem all that interested in doing all he could to get me in but my current recruiter, despite my age and the time constraint, seemed as though she would help me to the best of her ability. I’m very happy so far with my decision.